Exploring drum fills from the 60s through today’s most popular music, Chart-Topping Drum Fills is designed to develop your skills through sequential lessons with an emphasis on coordination, drum fill vocabulary, and a strong emphasis on drum fill selection – knowing what to play and when. Upon completion of this book, you will have dissected 100 drum fills from chart-topping songs and 200 coordination exercises. Kid’s Rock Drum Method will serve to introduce young students to drumming and help instructors and parents still searching for the optimal tool to teach the young beginner. This book balances hands-only work for dexterity with drum-kit and limb coordination study for the young beginner and strives to make drumming fun, educational and rewarding. The companion CD has many examples from the book to aid practice and home study. This easy to read chart makes getting started playing basic rock grooves a snap! Beginners of all ages will be playing grooves in no time using this simple guide which includes both drum tab format and standard drum set notation side by side. Drum tab is currently a popular tool for writing beats and communicating drum parts on the Internet. This chart makes it clear and easy to transition from reading tab to reading and understanding standard drum set notation. “Block Rockin’ Beats” has tons of cool grooves and fills for the intermediate to advanced drummer. This book reflects recent musical trends by focusing on funky rock, hip hop, jungle and drum ‘n’ bass influenced patterns for the drum kit. As time marches on, popular music continues to evolve and change. “Block Rockin’ Beats” is designed to give the drummer more ideas and tools to help function in a musical environment that was not only influenced by jazz, blues, gospel, country, soul, latin and funk styles – but also shaped by D.J.s, samplers and electronic music. Drummers are often called upon now to replace or ad to programmed drums in the recording studio. For live shows, live drumming might by melded together with electronic elements or D.J.s, or both. Rock and popular music are incorporating so many different elements and styles at this point, it’s hard to keep track! Update your rhythmic vocabulary with some “Block Rockin’ Beats”. 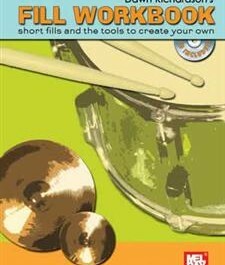 The purpose of “Fill Workbook” is to expand the players’ fill vocabulary by helping drummers create short fills. This is a flexible workbook that can be used by beginning and intermediate students and the more advanced drummer. Most playing situations are more about performing songs than solos, and usually this consists of not only playing grooves, but also of cuing the band into the various sections as they change. This is a tool to help the drummer break away from the “old favorites” and find new ways of playing short fills. The examples in “Fill Workbook” are meant to by used as a starting point to initiate ideas and are written for a basic drum kit set-up. The book can be easily modified by the teacher or player to suit the individual drummers’ level and to suit varying drum kit set ups. The accompanying CD contains 35 examples of 1/ 2 beat, 1 beat and 2 beat fills. The first 2 sections of the book are demonstrated as written. Fill Workbook (Mel Bay catalog number – MB99966BCD) can be purchased through Mel Bay publications. Call them directly to order @ 1 – 800 – 8 – MEL BAY (1-800-863-5229) or ask someone to order it for you at your local music store. Beginning drum books can make or break a student’s desire to learn the instrument. This book was conceived by a seasoned professional with the idea of developing a collection of exercises that effectively balance simplicity to hold the student’s interest. 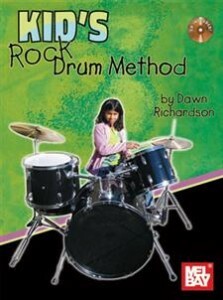 The techniques have been tried and tested through the author’s many years of teaching beginning rock drumming. The end result of the author’s efforts is a book that specifically addresses the rock drum kit as used in today’s pop music. This comprehensive, progressive method provides all the concepts and guidance needed to develop solid basic rock drumming skills.